HSP90s define a widespread family of molecular chaperones found in bacteria and all eukaryotes playing a fundamental role in protein synthesis, folding and degradation 141,142,143,144,145,146,147. Intracellular residing HSP90s launch a rapid response to environmental insults such as heat, hypoxia, UV and gamma-irradiation, reactive oxygen intermediates (ROI), and injury-induced growth factors 148. 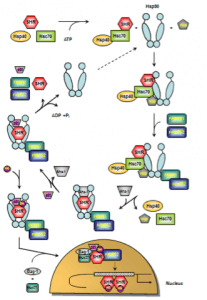 HSP90s are abundant and highly specialized ATP-dependent molecular chaperones essential for the integrity of multiple signalling pathways that are associated with cell proliferation and viability. Under thermal stress, HSP90s prevent denaturation of substrate proteins and promote refolding of denaturated proteins in a large cytosolic complex designated as the foldosome 1,149. In fungi and animals, HSP90s mediate extensive stress signal transduction including substrate activation as well as folding of steroid hormone receptors, transcription factors, and protein kinases 114,118, 150,. Moreover, HSP90s function as an important hub in a variety of protein interaction networks promoting tumour cell development 47,118,144,151. In malignantly transformed cells, HSPs enhance cell growth, suppress senescence, and confer resistance to stress-induced apoptosis including protection against cytostatic drugs and radiation therapy 6. With respect to senescence, Hsp90 binds and stabilizes the enzyme telomerase thereby delaying the onset of replicative senescence and underscoring the impact of Hsp90 in malignant transformation 152. Several oncoproteins have been identified as being targets of HSP90s rendering Hsp90 inhibition a promising approach in anti-tumour strategies 153,154. In recent years a wealth of evidence has been collected to demonstrate that inhibition of HSP90s contributes to degradation of many oncoproteins thus expanding anti-cancer approaches 22,114,118,155. Although a number of HSP90 genes have been identified as being induced by changes in temperature, salinity, and heavy metals in plants 156,157,158,159,160, their precise role as molecular chaperones and their molecular mechanisms are still a matter of debate. Recent studies revealed that plant HSP90s are important in plant development, environmental stress response as well as disease and pest resistance 62,161,162. As mentioned above, HSP90s are crucially involved in the functional activation of steroid hormone receptors (SHRs). SHRs play diverse roles in human physiology such as responses to stress, apoptosis induction, regulation of differentiation, sexual development, and, in general, maintaining homeostasis. SHRs are nuclear receptors that act as ligand-activated transcription factors whose activity requires the presence of numerous chaperones and co-chaperones 163. SHRs share a generalized domain structure / function relationship which not only comprises ligand and DNA-binding but also transcriptional activation domains 164,165. In the absence of the steroid hormone, SHRs reside in the cytosol bound to a complex of HSPs, chaperones and co-chaperones referred to as the foldosome 163. A set of several client proteins including Hsc70, Hsp90, and p23 participate in the assembly of the foldosome 166. In the early stage of foldosome assembly, the SHRs are firstly recognized by the Hsc70/Hsp40 chaperone complex in an ATP-dependent manner 167,168. This complex is modified by the docking of the adapter protein Hsp90/Hop (Hsp90/Hsp70 organizing protein) to the open-state Hsp90 to form the intermediate foldosome complex. As a member of the TPR family of proteins, Hop harbours three TPR domains (TPR1, TPR2A, TPR2B). While binding of Hsp90 occurs through the TPR2A domain, interaction with Hsc70 occurs via the TPR1 or TPR2B domain 169,170. Maturation of the foldosome complex is achieved by the ATP-dependent addition of the immunophilins FKBP51 (FK506-binding protein 51) and FKBP52 followed by a loss of Hsc70/Hsp40 and Hop. 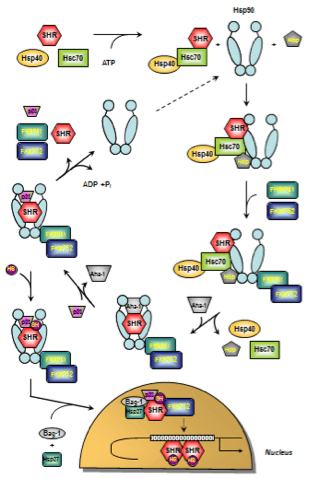 The release of these adapter proteins results from ATP-dependent conformation changes in Hsp90 that induce the closure of the N-terminal domains attenuating Hop’s affinity for the complex 171, 172. This N-terminally dimerized Hsp90 conformation now shows high affinity for p23 which stabilizes the Hsp90-complexed SHR 173. Recruitment of p23 is facilitated by the Hsp90 ATPase activator Aha-1. Aha-1 which associates with the MD of Hsp90 has recently been shown to contribute to maturation of SHRs, proposing a general role for this cofactor in the activation of Hsp90-dependent client proteins 174. The SHR is now able to bind the steroid hormone 175 leading to conformational rearrangements culminating in activation and release of SHR subsequenty followed by nuclear translocation, receptor dimerization and binding to response elements in regulatory regions of certain target genes 176,177. Studies probing glucocorticoid receptor (GR) import revealed an active contribution of foldosome constituents to SHR nuclear translocation 178,179,180. Apart from p23 and FKBP51/52, further chaperones and co-chaperones have been described to have nuclear effects on SHR action such as Bag-1, Hsp10, Hsp27, and Hsp60 163,175,181,182. These molecules are not directly involved in foldosome assembly but associate with it thereby playing a critical role in SHR signalling 163. At present, the SHR nuclear translocation is not completely understood and controversely discussed in the literature. Davies and colleagues propose an FKBP51/52 exchange concept as a new first step in the hormonal activation of SHRs 183. In this study, the authors postulate that hormone binding to the GR induced substitution of FKBP51 for FKBP52, and concomitant recruitment of the transport protein dynein while leaving Hsp90 unchanged rather than causing immediate dissociation of the cytoplasmic GR heterocomplex. Moreover, this work further revealed a hormone-induced translocation of the hormone-generated GR-Hsp90-FKBP52-dynein complex from cytoplasm to nucleus, a step that precedes dissociation of the complex within the nucleus and conversion of GR to the DNA-binding form 183. However, the concept of immunophilin interchange as the earliest known event in SHR signalling has been modified by Cano et al. in the meantime 163 and included in Figure 4 in which a proposed model of the ATPase-driven SHR activation cycle is given. One major role of Hsp90 appears to be to promote and maintain the proper assembly of multiprotein complexes such as snoRNA, RNA polymerase II, PI3K-related protein kinase (PIKK), telomere complex, kinetochore, RNA-induced silencing complex (RISC), and 26S proteasome. Without being part of the final assembled complex, Hsp90 has been shown, on the one hand, to mediate complex assembly by stabilizing certain protein subunits and facilitating their complex incorporation, and on the other hand to promote changes in the composition of the complex 184. For all these functions, the ATPase activity of Hsp90 is generally required. With regard to the 26S proteasome, Hsp90 has been identified as being involved in maintaining its structural integrity by tightly associating with the 19S cap component 185,186. However, Hsp90 does not seem to be exclusively involved in the assembly of the 26S proteasome since Hsp90 inhibition by geldanamycin only partly and transiently disrupted the 26S proteasome structure 185. From these findings it can be concluded that further distinct molecules might be implicated in the re-assembly of the 26S proteasome. While intracellular HSP90s play a key role in proteomic homeostasis, membrane-bound and extracellular HSP90s have been shown to act as potent stimulators of immune responses 4,5. The group of Pramod Srivastava has convincingly demonstrated that Grp94 (Gp96)-chaperoned peptides derived from the cytosol of human tumours can activate a classical protective T cell-mediated immune response 187. The induction of such immune responses involves the uptake of HSP–peptide complexes by antigen-presenting cells (APCs) and the transfer of these peptides into the MHC presentation pathway for subsequent cross-presentation on MHC class I molecules to appropriately specific CD8+ T cell populations 187. A wealth of evidence demonstrates that extracellular HSPs can stimulate cellular cytokine synthesis with the generation of pro- and/or anti-inflammatory cytokine networks regardless of chaperoned peptides. Cell stress can also control cytokine synthesis, and cytokines are able to modulate the synthesis of selected cell stress proteins and may also promote their release 188. Hsp90 has been shown to modulate cytokine release, inter alia, in a two-way process since the cytokine cardiotrophin-1 (CT-1) was found to induce Hsp90α synthesis 189. For instance, the Hsp90 inhibitor geldanamycin was reported to inhibit the synthesis of pro-inflammtory IL-1, IL-6 and TNF in murine macrophages exposed to LPS by decreasing stability of transcripts 190. Hsp90 blockage appears to affect a variety of transcriptional systems critically involved in cytokine synthesis. It has been reported previously that pharmacological Hsp90 inhibition affects the NF-κB activator IKK (IkappaB kinase) complex by down-modulation of the IκBα, IκBβ and IκBγ subunits thereby inhibiting NF-κB signalling in general 191,192. Hsp90 inhibition also inhibits expression of the oncogene Akt as well as IKK and reduces immune-stimulated production of IL-6, TNF and NO in murine macrophages 193. 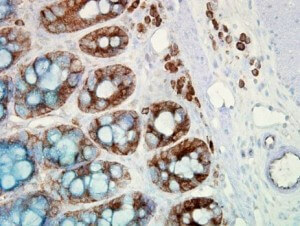 More recently, tumour-derived chaperone-rich cell lysates (CRCL) containing Hsp90, Grp94, Hsp70, and calreticulin have been identified to directly stimulate pro-inflammatory cytokine and chemokine production by NK cells, which may lead to activation and recruitment of macrophages at the tumour site thus providing further insight into the function of CRCL in anti-cancer immunity 194. A well-characterized property of extracellular Hsp90 is to promote cell motility, a central event in wound healing and cancer. Extracellular Hsp90 plays pivotal roles in driving a non-motile tumour cell to become motile and invasive as Hsp90 affects any step in tumour invasion including degradation of the extracellular matrix, adhesion as well as migration of tumour cells 195. It has been shown previously that Hsp90 inhibition reduced cell motility and invasiveness of tumour cells associated with a decrease in the number of filopodia, lamellipodia, and F-actin bundles 196. The study also revealed a significant decrease in the level of Rho A (Ras homolog family member A) and depletion of mDia-2 (mammalian homolog of Drosophila diaphanous 2) from the cell periphery upon Hsp90 inhibition. Both molecules are known as being involved in the generation of contractile forces 197 and the formation of lamellipodia 198. Interestingly, co-immunoprecipitation of Hsp90 revealed an interaction of Hsp90 with the soluble form of actin (G-actin) that increased upon Hsp90 inhibition. Moreover, the authors also observed a pull-down of αB-crystallin with the immunoprecipitate of Hsp90 in human breast cancer cells over-expressing αB-crystallin. These findings clearly suggest an increased interaction of Hsp90 with G-actin and αB-crystallin upon Hsp90 inhibition which might be responsible for the decreased actin tread-milling at the cell periphery 198. The mechanisms involved in Hsp90-mediated cell motility has been extensively reviewed by Li and colleagues 122. As already discussed before, normal cells secrete Hsp90α in response to environmental stress cues. HIF-1α, the oxygen-regulated subunit of HIF-1, functions as a central regulator of the Hsp90α release 130. The widely expressed cell surface receptor Lrp-1 (also termed CD91) was identified by Cheng and co-workers as the receptor for extracellular Hsp90α involved in promoting cell migration 140. The same group identified a 115-amino acid fragment of Hsp90α, termed F-5, as being responsible for promoting skin cell migration in vitro and wound healing in vivo to the same extend as full-length Hsp90α 199. The authors hypothesized that extracellular Hsp90α may act as an autocrine and paracrine factor promoting cell motility not only for tissue repair but also for tumour invasion and metastasis. In many tumour types, HIF-1α is constitutively activated and triggers Hsp90α release even in the absence of any environmental stress insult. Tumour-derived extracellular Hsp90α then promotes tumour cell migration by interacting with either Lrp-1 or other targets including MMP-2 200, MMP-9 201 and Her-2 tyrosine kinase receptor 202.